The Nederfrederiksmose Man (also known as Kraglund Man or Frederiksdal Man) was found May 25th 1898 in Fattiggårdens mose near the village Kragelund, north west of Silkeborg, Denmark (also approximately 15 miles south of Viborg, Denmark). The man wore a kirtle of coarse woolen cloth, the legs were bare but on his feet he had short leather boots, laced over the instep. The boots are not preserved. Because of the boots, the find was originally dated to the 12th or 13th Century. Porl Grinder-Hansen, curator Danish Middle Ages and Renaissance, Nat. Mus. of Denmark had this carbon14 dated in 1998 by the AMS-laboratory in Århus, Jutland, using the accelerator technique and calibrated according to Stuiver and Pearson 1993. It was dated to c.1040-1155. 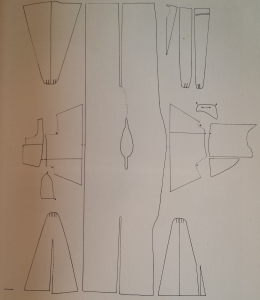 Measured drawing of the Kragelund gown from p. 125 of Woven Into The Earth. Image shows front middle gore at the bottom left. back middle seamed gore is showed at the top left. 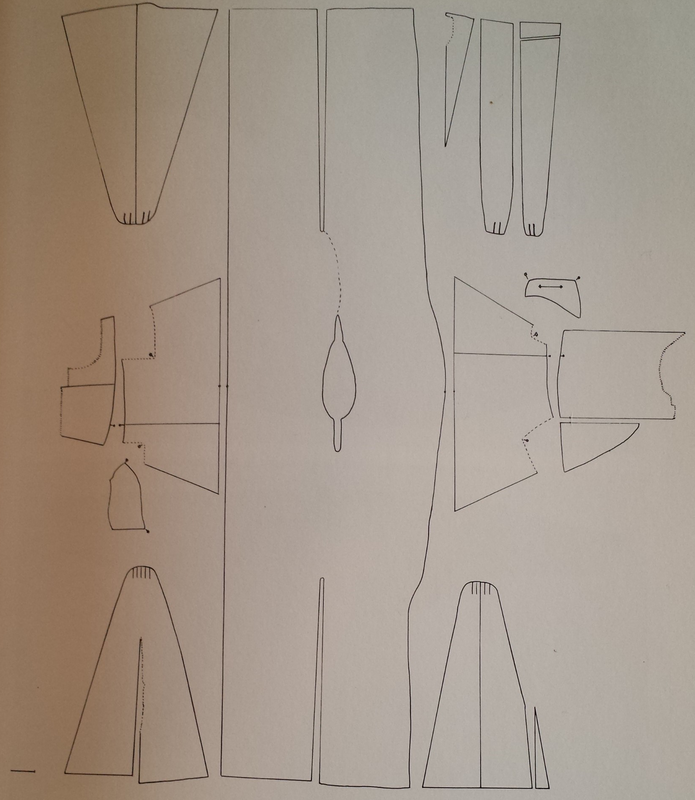 Left seamed gore is shown at top right and right seamed gore is shown at top left. Else Østergård in “Woven into the Earth” p.125 notes that the shoulder width is 630 mm, (about 25 inches) and that there is a selvedge along one side of the body piece. Need source: the sleeves are asymetrical made up of a rectangle, triangle and a trapezoid. 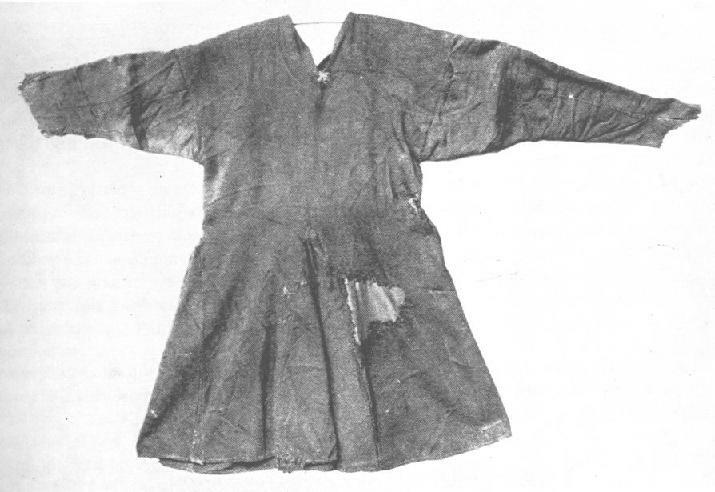 Else Østergård in “Woven into the Earth” (p. 125) has a very nice pattern (shown right) showing the original pieces used to make up the tunic also has nice colored photo of the tunic front and back on page 126. The pattern presented by Marc Carlson (and by extension Margareta Nockert and Margrethe Hald) is a very simplified (possibly over simplified) version based on the original. – Sleeves do not include an underarm gusset. That seems to be built into the flair of the upper portion of the sleeve. 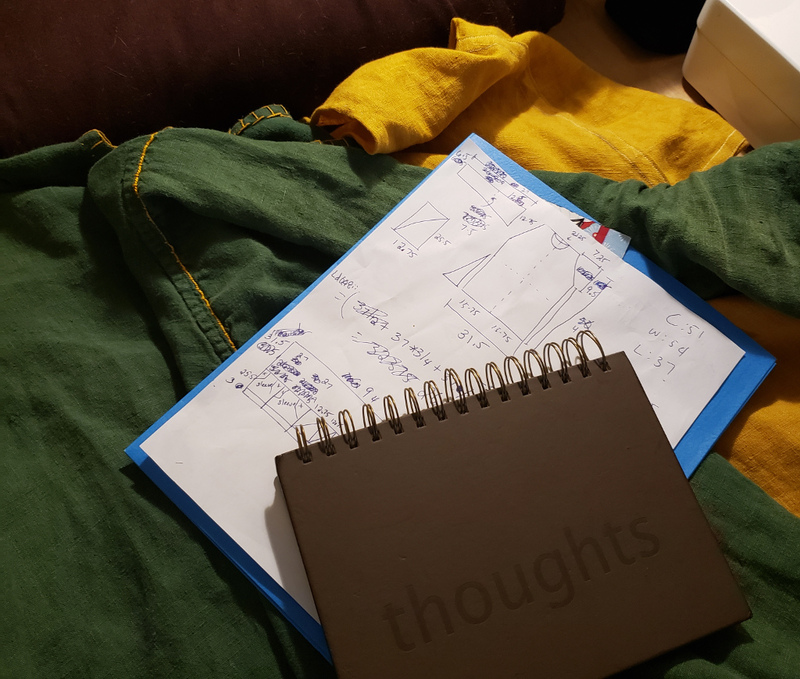 – The upper pieces of the sleeves are seamed together but the seams are asymmetrically connected to the tunic. That is, the person who created the garment did not ensure that the seam in the upper piece of the arm was on the front of the garment on both the left and right (coincidentally this is similar to the way the right and left sleeve of the Viborg Shirt are also constructed. Though in that case the seam on both sleeves is on the front of the garment.. the asymmetry comes in that a different type of seam is used on the left vs the right sleeves). – Sleeve has a seam encircling the elbow. – Original sleeve has odd-shaped pieces of fabric at the elbow. If I had to guess I’d say these are patching holes that occurred in the original tunic from wear over time. Though there has been suggestion that this is a gusset at the elbow. – The front gusset is split while the back gusset is seamed closed. – All four gussets are pleated at the top. – The tops of the gussets occur well below the bottom of the sleeve. Hald, Margrethe. Ancient Danish Textiles from Bogs and Burials tr. Jean Olsen. Copenhagen: National Museum of Denmark, 1980. Østergård, Else. “Woven into the Earth: Textiles from Norse Greenland.” Aarhus University Press: Denmark, 2004.